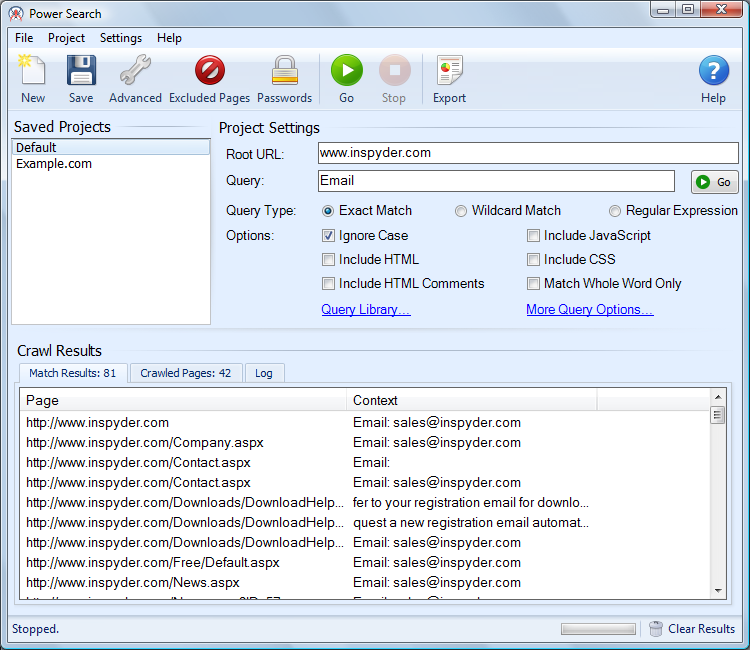 Inspyder Power Search is an easy to use tool for finding and extracting data from virtually any website. Power Search can crawl any website to look for specific words or phrases, or extract data using a simple but powerful expression based query. Inspyder Power Search Features: Just enter your website's URL, your query, and click 'Go; Parse data from a website using the power of Regular Expressions; Query Library; Scheduled Crawling; CSV Export. * Low Cost - Inspyder Power Search has a one-time cost ($39.95 per user-license), whether you run one or 100 queries, for as many sites as you manage. No monthly fees! * Regular Expression Support - Parse data from a website using the power of Regular Expressions! * Query Library - Use predefine Queries to get up and running fast! * Scheduled Crawling - Power Search can be configured to automatically collect and save data on a daily, weekly or monthly basis. * CSV Export - Save captured data and open it with Microsoft Excel or Access! A user-friendly thumbnail image creator for folders with subfolders or disks. Search in PDF files for the information you want quickly and easily. Qweas is providing links to Inspyder Power Search 3.2.5 as a courtesy, and makes no representations regarding Inspyder Power Search or any other applications or any information related thereto. Any questions, complaints or claims regarding this application Inspyder Power Search 3.2.5 must be directed to the appropriate software vendor. You may click the publisher link of Inspyder Power Search on the top of this page to get more details about the vendor.